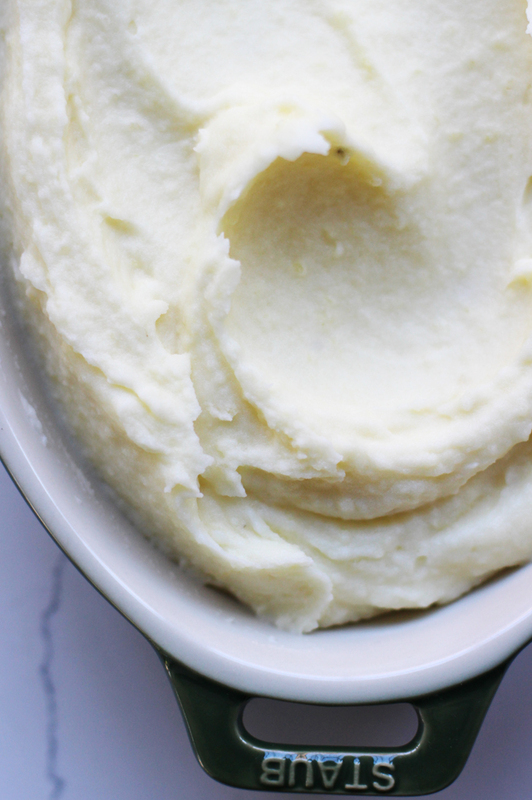 I know “best mashed potatoes ever” is a bold claim, but these mashed potatoes really are the silkiest, smoothest and creamiest mashed potatoes ever. Like, lick-the-bowl-clean good. 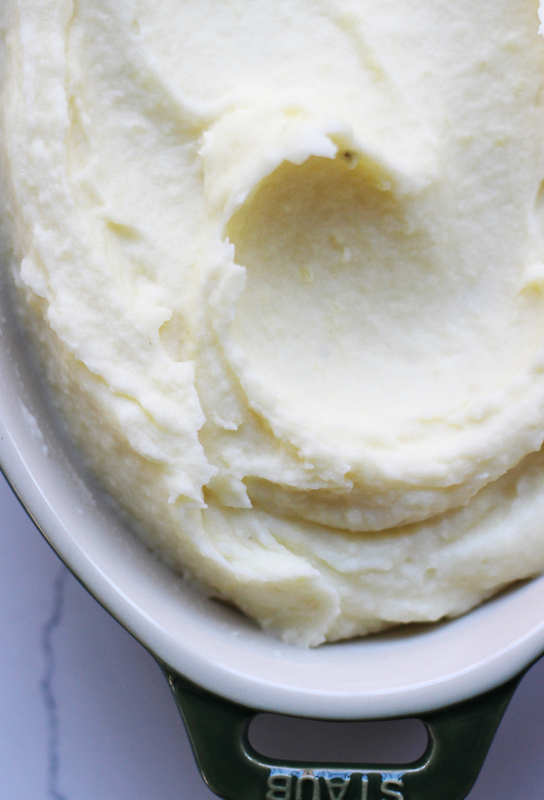 I’ve been making mashed potatoes for years (they’re quite possibly my favorite form of carb) and have learned that there are certain tricks to making mashed potatoes heavenly. And no, my trick is not a pound of butter. First, I like to use a waxier potato like a Yukon Gold rather than Russet. Second, I’ve found that using a potato ricer (or food mill) is a must. It’s the only way to get that ultra-smooth texture. Also, make sure your cream is hot when you add it into the potatoes. Finally, I think just a little tangy creme fraiche cuts through the richness of the cream and butter in a way that is so subtle you probably won’t even notice it. Trust me, you want a big heaping bowl of this on your Thanksgiving table. Start by peeling your potatoes. Quarter the potatoes and add them to a medium pot of heavily-salted cold water. Bring the water to a boil and then turn down the heat to a gentle simmer. In a small sauce pan, heat (don’t boil) the cream over medium low heat. Once the cream is hot, turn the heat down to low to keep the cream hot. You can tell the potatoes are done if you can easily pierce the center of the potato with a dull knife. Once they’re done cooking, drain the potatoes and pass them through a potato ricer into a large bowl. Using a wooden spoon, gently stir about 3/4ths of the cream into the potatoes (but don’t over work the potatoes). Fold the soft butter into the potatoes one tablespoon at a time. Fold in the 3 tablespoons of creme fraiche. The potatoes should be very smooth and silky. Add more cream if your potatoes need it. Remember that as your potatoes sit they will absorb more and more moisture so err on the side adding more liquid to your potatoes. Taste and add salt if needed. Fill a medium-sized pot with cold water. Heavily salt the water and add the potatoes. Turn the heat on high and bring the water to a boil. Lower the heat to a simmer and cook until the potatoes are tender. You can tell the potatoes are done if you can easily pierce the center of the potato with a dull knife. In a small sauce pan, heat (don’t boil) the cream over medium low heat. Once the cream is hot, turn the heat down to low to keep the cream hot. Strain the potatoes and pass them through a ricer into a large bowl. 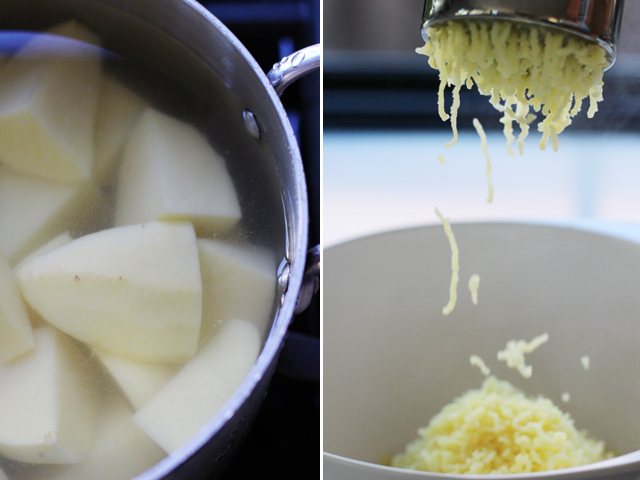 Using a wooden spoon, gently stir about 3/4ths of the cream into the potatoes (but don’t over work the potatoes). 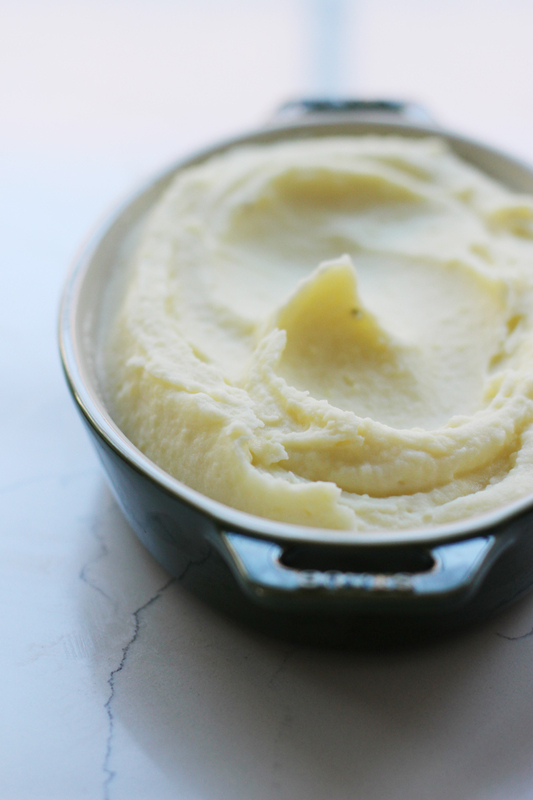 Fold the soft butter into the potatoes one tablespoon at a time. Fold in the 3 tablespoons of creme fraiche. The potatoes should be very smooth and silky. Add more cream if your potatoes need it. Remember that as your potatoes sit they will absorb more and more moisture so err on the side adding more liquid to your potatoes. Can you tell me how many this feeds? Thank you! Made this last year & it was a huge hit! This year I am hosting T-day at a vacation house (3 hours away) with a tiny kitchen. How much of this dish can I pre-prep? Can it be made ahead and reheated? Thanks! Oh great question– I’ve never made these ahead but I think the best thing to do is to make the whole thing ahead of time and re-heat. You may need to add a little more moisture to them after re-heating so you could add a little more creme fraiche or scalded cream just to give it the right texture. Sound weird, but when I was younger I used to love it when there were lumps left in my mash! If you peel the potatoes a few hours before cooking (overnight even) and allow them to soak in cold water, a portion of the starch will dissolve into the water making the resulting mash much lighter. This works for french fries too. 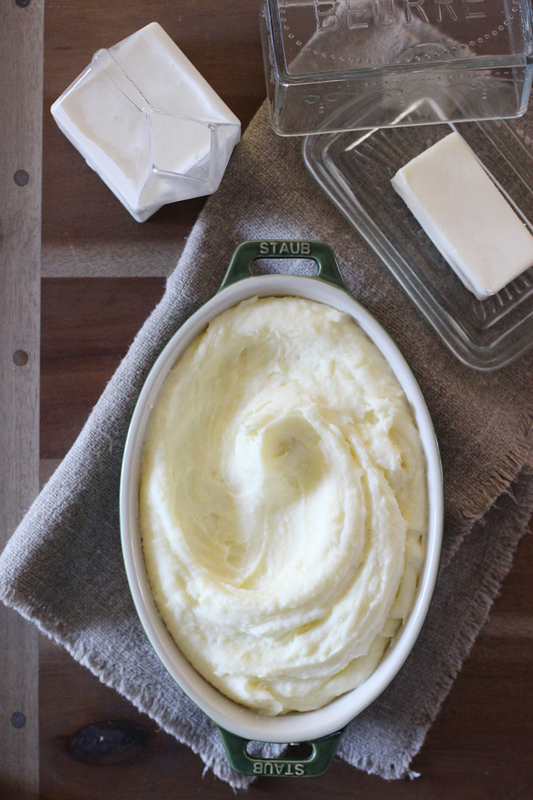 Mashed potatoes are my absolute favorite way to prepare those spuds! I definitely need to try this adding creme fraiche in there! Adding creme fraiche is a fantastic idea!! These look wonderful! such a great take on a classic. I love potatoes super creamy, so the ricer sounds like the perfect way to get that perfect texture! I believe you, they really do sound like the best…creme fraiche and the potato ricer convinced me — I want to dive right in and roll around in that stuff!